The most practical and intelligent design been introduced to have zygomatic anchourage avoiding cantiliver situation. Because of its dedicated bendable zone the palatal emergence is avoided which is the main drawback and shortfall of conventional designs. 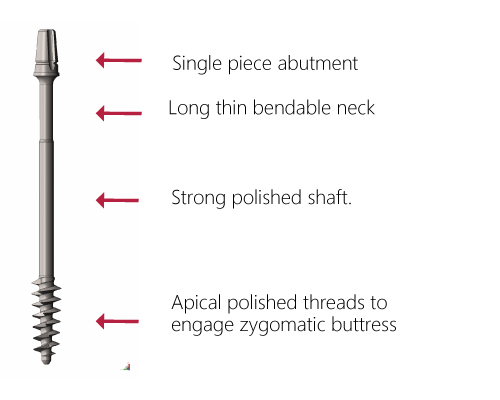 The zygomatic implant has palatal insertion and can be bendaded to make prosthesis at desired occlusal position. Being single piece its possible to place flapless without expensive guided surgery and resulting in least traumatic placement .